Today, the Ukrainian Parliament voted to remove President Viktor Yanukovych. Yanukovych immediately started crying, “Coup!” I’m sure Putin is on his speed dial and heard all about it. Yanukovych is defiantly stating that he is not going anywhere — he has no intention of resigning and fleeing the country. Screw the downtrodden masses. Don’t they know who he is? If he sincerely meant that, he would cede power to the opposition and let freedom take its course. But, you see he only cares for power, as does Putin. Evil tyrants are nothing if not predictable. The Ukrainians have moved elections up now to May 25th. They aren’t messing around – their lives and freedom depend on this. I admire these brave souls. America should be ashamed. She has broken her agreements with the Ukraine and once again has left the people to fend for themselves. Our president is not only naive, but he appears willfully naive. On some profound psychological level, he seems to be really afraid of Vladimir Putin because he’s letting Putin run all over us on Iran, Syria, Snowden, that dreadfully one-sided START deal. I’m starting to wonder if there’s some crazy agreement between these guys, and I’m not a conspiracy theorist. Why, yes, there is… Let’s hope the rest of America wakes up to this stark truth before it is too late. The rest of the world already gets it. The Ukrainians believe impeachment was unavoidable. “Yanukovych is not capable of fulfilling his presidential duties,” said opposition lawmaker Oleh Lyashko. They are also getting ready to ban him from ever running for president again, just for good measure. I know George Soros was hip deep in the Orange Revolution and I am not familiar with her political stances, but it’s got to beat Communist Russia and the FSB. Freedom is always better. The official number of dead is somewhere between 82 and 100, but it is believed it could be many more and Putin hasn’t had his day yet. The police have abandoned their posts in the capitol and the opposition has stormed and taken over the palace. MPs have replaced the Parliamentary Speaker and the Attorney General; they have also appointed a new pro-opposition Interior Minister. Gee… our Congress might want to take notes and heed the example of people who actually get something done. Protestors have moved uncontested into the Presidential Office and residence. The real journalists are finally free and roving. Hey, Yanukovych… heck of a peace deal you got there! One thing is for sure, he ran like a whipped cur with his tail between his legs – his own guards deserted him. His aides say he is in Kharkhiv, close to the border with Mother Russia. The deal has been met with scepticism by some of the thousands of protesters who remain in the square. Opposition leaders who signed it were booed and called traitors. The US and Russian presidents have agreed that the deal needs to be swiftly implemented, officials say. Russia’s Vladimir Putin told Barack Obama in a telephone conversation on Friday that Russia wanted to be part of the implementation process, a US state department spokesperson said. The Russian Foreign Minister Sergei Lavrov told the US Secretary of State John Kerry this evening that the peace deal signed yesterday had been “sharply degraded by opposition forces’ inability or lack of desire” to respect it. “Illegal extremist groups are refusing to disarm and in fact are taking Kiev under their control with the connivance of opposition leaders,” Lavrov told Kerry by telephone, according to a Russian Foreign Ministry statement. Lavrov “reminded” Kerry that President Vladimir Putin had urged US President Barack Obama during an earlier call to “use every opportunity to stop the illegal actions of radicals and return the situation to constitutional channels”, it said. Is it just me, or do Putin and Obama sound eerily similar? Looks like your cozy little Communist pact fell through. Guess it’s time to get your violence on. That’s where jack booted thugs and traitors always go, right? Welcome to the Cold War that never ended… it merely shifted and like gullible fools, the world parroted it and fell for it. Rubes. Surely, Obama sees his future in Putin. It would appear that the Fatherland Party and Ms. Tymoshenko are ascending. They have remarkably disciplined fighting squads and loyal lieutenants. The power vacuum has been filled on that end. With their economy in tatters, she will surely move to solidify ties with the EU. Wait… didn’t you just insist on a deal two days ago? Huh. Now you demand their freedom. You give the Greek Goddess Eris a run for her money. I’d bet next week when Putin charges in, you’ll speak out of both sides of your lying mouth, hoping to win either way. The clock is ticking and Russia is calling. Putin will almost assuredly come down hard, send in tanks and military and take back his rogue satellite country and solidify power and territory. And that is just the beginning. Next on tap… Georgia and Europe, you are on Vladimir’s dance card. You didn’t think oil, gas and protection would come without a high price, right? Get ready to dance with the Russian bear. 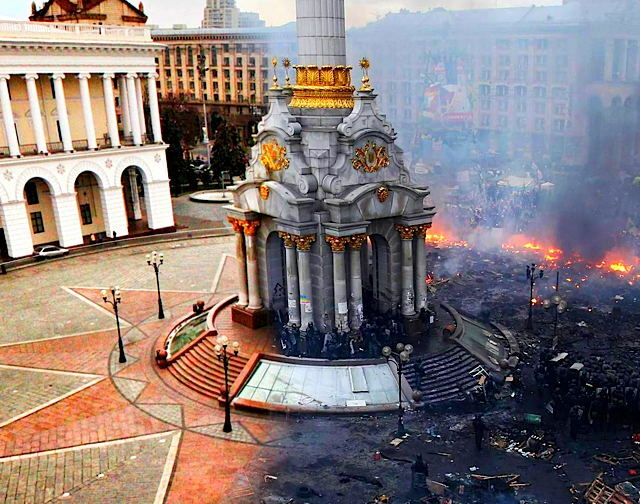 Ukraine is a look into America’s possible future if we don’t get a hold on our Republic and clean House and Senate in 2014. Here’s to the damned, the lost and the forgotten. Read the Tea leaves.